Famed US news rag The Washington Post has run a full page ad attacking Lorde for canning her controversial Israel concert. ICYMI: the kiwi alt-pop queen pulled the plug on the gig she had planned for the hotbed of religious conflict following a backlash from some fans, announcing that after “lots of discussions” on the matter she’d come to the conclusion that axing the event was the “right decision”. But now she’s getting slammed for the move, with the massive spread in the Post calling her a “bigot” and a “Jew-hater”. 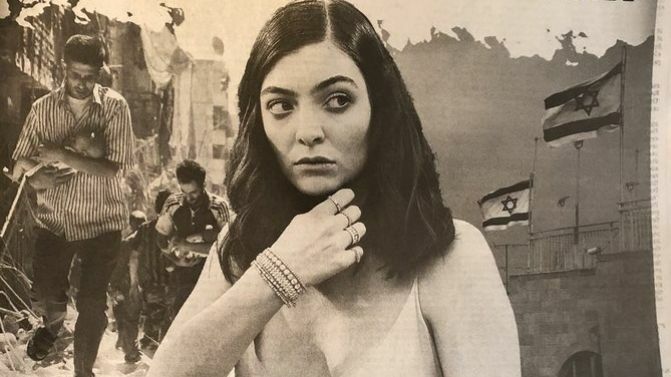 As the ABC reports, the hot piece of paid propaganda in the December 31st edition of the paper is headlined “Lorde and New Zealand ignore Syria to attack Israel” and rails against the ‘Green Light’ singer for cancelling her show in the country’s capital Tel Aviv, while also attacking NZ for voting (alongside over 100 other countries, just FYI) in favour of a United Nations resolution, calling for the US to drop its recognition of Jerusalem as Israel’s capital. “Tragically, New Zealand’s growing prejudice against the Jewish State seems to be trickling down to its youth,” the ad reads. It also goes on to criticise the 21-year-old for joining “a global anti-semitic boycott of Israel” while still performing in Russia. “While Lorde claims to be concerned with human rights, she hypocritically chose to proceed with her two concerts in Putin’s Russia, despite his support for Assad’s genocidal regime which has already claimed the lives of over 500,000 innocents,” the ad states. However, in the wake of the ad, Lorde has had an unexpected supporter come to her aid in the form of fellow kiwi music legend, Neil Finn of Crowded House. He’s taken to Twitter to call out the dude responsible for running the spread — outspoken US rabbi Shmuley Boteach — saying he “should be ashamed of himself”. “Lorde is not the enemy, nor is NZ,” Finn writes. Lorde’s cancellation of her Israeli show comes after a number of prominent musicians — including Pink Floyd’s Roger Waters, Sonic Youth’s Thurston Moore and TV On The Radio’s Tunde Adebimpe — joined the Artists For Palestine UK movement to urge others not to perform in the country. Check out The Washington Post‘s anti-Lorde ad below.